Last night, the chicken I took out of the freezer on Saturday (!) was finally fully defrosted. What to do with it? Generally, my rosemary kick translates to rosemary chicken, but we weren’t in the mood for that. We had a ton of cilantro, some beer in the fridge…why not beer can chicken with lots of cilantro and lime? 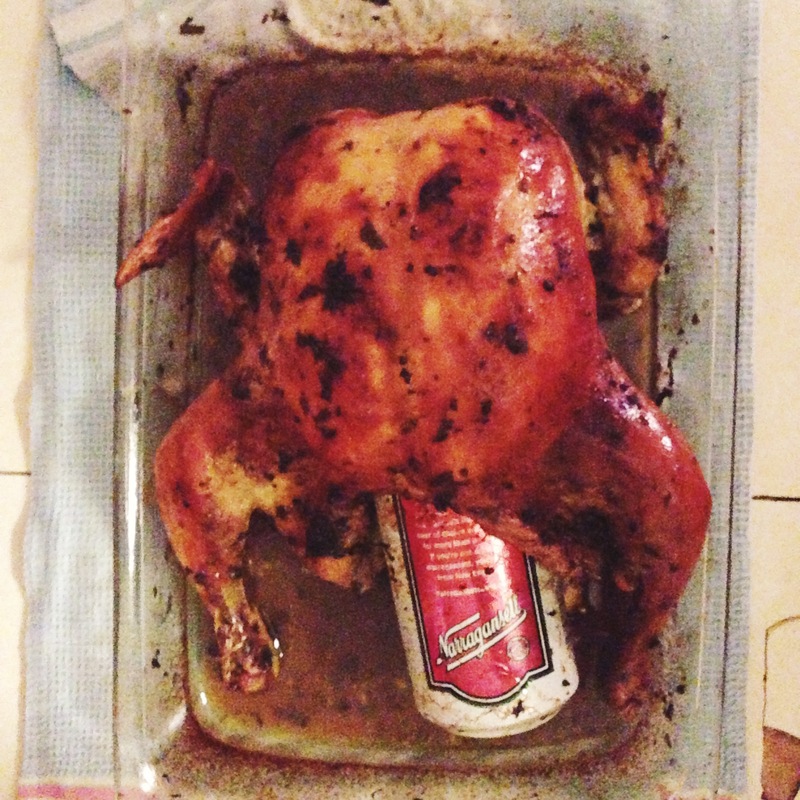 I’d never made beer can chicken before and I wasn’t entirely convinced the can wouldn’t somehow explode in the oven, so I let M be in charge of that. He adapted a recipe from Cooking for Keeps and I got to work on the sides. I had dry black beans from the Charlie’s Redhouse Farm and when I googled “dry black beans?” the first result was the always trusty J. Kenji López-Alt of Serious Eats. I have made a bunch of his recipes before, from the normal (really yummy french toast) to the weird (cranberry and turkey stuffed latkes. Remember Thanksgivukkuh? ), so I trusted him when he said there was no need to soak the beans overnight. I used a Serious Eats recipe he recommended, subbing lime for orange, planned to make rice using this method I learned from Wanderlust Kitchen (it seriously makes the best rice), we were on our way. It was a slow “on our way,” to be honest. In typical fashion, we hadn’t started cooking till after 7, not realizing our grand ideas would mean we would eat around 9:45. Oh well, We killed time by watching TV and doing a puzzle. Adulthood!